Now in its eighth year, the story-writing competition for children aged between 5 and 13 has seen another record year attracting a staggering 135,000 entries. In addition, 500 Words was supported by Oxford University Press in 2018 to reach over 20,000 schools. Each and every one of this year's entries was read by a fantastic team of 5000 volunteer teachers and librarians from around the UK, before being whittled down to the Top 50 finalists by The Reading Agency. The 500 Words' panel of judges then had the gruelling task of selecting three winners in each of the two age categories (5-9 and 10-13 years) from this group of talented young writers. 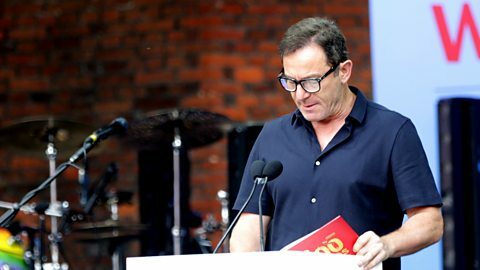 The final, presented by Chris Evans, promised to be an extravaganza of live music and sensational story-telling, with the six winning wordsmiths announced on-air by celebrity narrators including David Walliams and Dara O'Briain. There was fantastic music from John Newman, Alexandra Burke and Bastille. 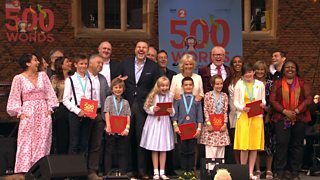 The 500 Words' panel of judges - Charlie Higson, Francesca Simon, Frank Cottrell Boyce, Malorie Blackman and Honorary Judge, Her Royal Highness The Duchess of Cornwall - were also present at this extra special edition of The Chris Evans Breakfast Show. Catch up on all the highlights right here! On a noisy, dusty road, a child's bare brown feet are hardly noticed as she weaves in and out of the traffic, dodging cattle and halting at taxis. She presses her nose against the windows of vehicles carrying crowds of tourists. "Tissues ma'am, tissues sir, only ten rupees for a box". Sita is small for a seven year old, but then seven year olds from the slums in Ahmedabad are often smaller than other children..."
Read Sadhbh's story in full here or watch Shobna read it to the 500 Words Final audience below. 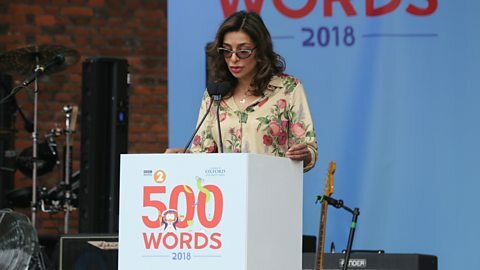 Shobna Gulati reads the the Gold award wining story in the 10-13 age category. "In a magical land lived lots of beautiful fairies. There was the Tooth Fairy, the Sugar Plum Fairy (the most popular because she gave everyone sweets) and plenty of other fairies with perfect hair, pink and sparkly dresses and all different kinds of fairy hats and tiaras. They wore lots of lipstick and blusher to make their cheeks red and rosy plus sparkly perfume that smelled like cherries. 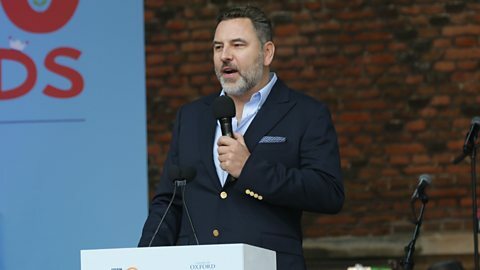 Every fairy carried a wand to match their outfit..."
Read Evan's story in full here or watch David Walliams read it to the audience at Hampton Court Palace below. David Walliams reads the Gold Award winning story in the 5-9 age category. 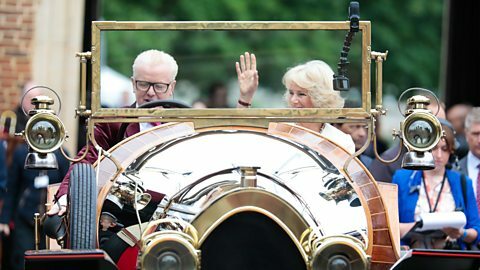 500 Words fairy godmother and honorary judge Her Royal Highness, the Duchess of Cornwall made a very special entrance with Chris Evans before addressing the audience at Hampton Court Palace. Live from Hampton Court Palace on The Chris Evans Breakfast Show. It is with much regret that I have chosen to resign from my position as Lead Deity of Area 25541, specifically, Earth. I have learnt very much from my time at Gods & Deities Inc. and will cherish the relationships I have formed with the beings there forever. This was not an easy decision to make, but I believe it is in the best interests of my career advancement and development as a sentient being. I have thoroughly enjoyed my time working for you. Actually, you know what? That's a lie. I have not enjoyed my time at Gods and Deities Inc. at all. Would you like to know why? Humans..."
Read Aiofe's story in full here or watch Amanda's cracking reading of it at the final below. 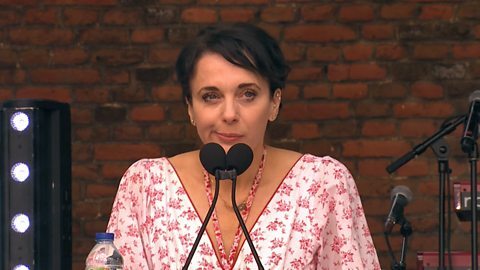 Amanda Abbington reads the Silver award wining story by Aoife Maddock. "The little brown bird hopped, skipped and jumped across the small silvery garden that cold frost must have breathed on the night before. He fluttered his little wings and puffed out his chest that looked like he was wearing a crimson bib. He was on a very important job and puffing out his chest was an important part of that job.He hopped, skipped, jumped and fluttered some more and landed on one windowsill after another. The red bricked building was old and big and a lot of work for a little bird to get around. However, he managed to land on every windowsill of every room where one of the elderly residents slept..."
Read Fionn's story in full here or watch Jim read it in style to the audience at Hampton Court Palace below. 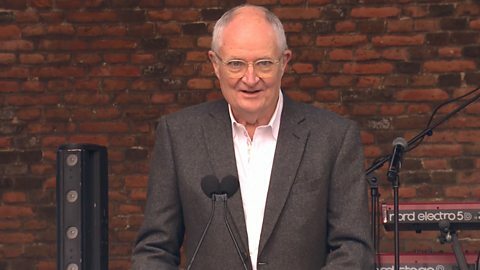 Jim Broadbent reads the Silver Award winning story in the 5-9 age category. "We lay there, dead still, holding our breath, waiting for the moment to pass. My mother had her hand over my little brother's mouth. We could sense their presence above the floorboards, scouring the kitchen, scouring the area of all movement, all sound, all smell. Suddenly, we heard their clunking feet march out of the room. My father let out a sigh of relief. "That was too close." he said. "All they had to do was lift a floorboard and we would have been done for". I lay my head on my dusty pillow. All night the image of two animatronic eyes piercing through the floorboards was pasted on my mind..."
Read Arthur's story in full here or watch Jason read it in front of the live audience at the final below. "Everything was quiet, everything was in order, everything was cleen. A row of pressed uniform onsies hung in the station. The smell of eco-friendly washing powder filled the air. "FAT ALERT, FAT ALERT!!" The warning siren screemed..."
Read Francesca's story in full here or watch Dara's reading of it at the final below. 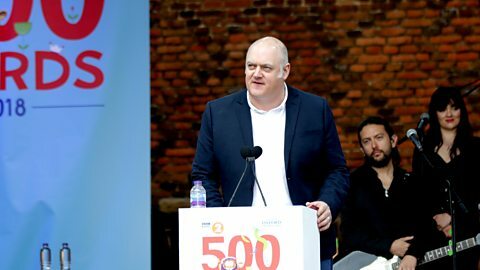 Dara Ó Briain reads the Bronze winning story in the 5-9 age category by Francesca Wade. Radio 2 Tweet of Vassos Alexander entering the venue in full Tudor dress.